If climate arguments aren’t your MO, try this one on for size: Animal agriculture is soaking up an enormous portion of our arable land, drinkable water, edible food and combustible fossil fuel resources. According to a study published in the American Journal of Clinical Nutrition, livestock in the US consume more than 7 times as much grain as the American population—enough grain to feed about 840 million people. The same study finds that roughly 25 kilocalories of fossil fuel energy are consumed for every 1 kilocalorie of meat protein produced, compared with a 2.2:1 ratio for corn. And producing 1 kg of animal protein requires 100 times more water than 1 kg of grain protein, in part because we have to take the water used to grow the animals’ food into account. You can read the full report for additional statistics, but you’ll find that on nearly every measure, raising livestock takes a lot more resources per calorie out than growing edible plants does. The results showed that production of 1000 kg cultured meat requires 26–33 GJ energy, 367–521 m3 water, 190–230 m2 land, and emits 1900–2240 kg CO2-eq GHG emissions. In comparison to conventionally produced European meat, cultured meat involves approximately 7–45% lower energy use (only poultry has lower energy use), 78–96% lower GHG emissions, 99% lower land use, and 82–96% lower water use depending on the product compared. Despite high uncertainty, it is concluded that the overall environmental impacts of cultured meat production are substantially lower than those of conventionally produced meat. That all sounds promising, but in reality, cultured meat will only save us resources and reduce the meat industry’s environmental footprint if we can produce the stuff at economies of scale. The meat growers of the future are dreaming big, but the scientific and engineering challenges ahead are also enormous. Still, one can argue the demonstration was less about the meat’s flavor and more about what scientists had managed to accomplish. Over the course of three months, Post’s lab turned a handful of stem cells extracted from a cow’s shoulder into a patty consisting of 20,000 individual muscle fibers. Keeping those cells healthy, well-fed and contamination-free during their growth was no small feat — in fact, it’s something biomedical engineers in the artificial tissue business have been struggling to do for over a decade. But with a $300k price tag and a mediocre review, Post knew he had to do better. He’s spent the last two years refining the process, and I caught up with him over the phone to hear how it’s been going. One of the big takeaways from the 2013 cultured burger demo was that meat just ain’t right without fat. So, Post’s lab is now culturing fatty tissue in addition to muscle fibers. Working out that process has taken some time. Until now, there hasn’t been a whole lot of scientific interest in culturing fat cells, and methods that did exist used chemicals we don’t really want to be eating. Right now, Post’s lab is culturing beef fat and muscle tissue separately, and mixing the two after the fact. In the future, Post imagines combining the two cell types in a co-culture. But first, there are a couple other burger basics the team is trying to improve on. For one, Post would like to eliminate the use of animal products (stem cells aside, obviously) from the culturing process. In laboratories, cells are often grown using a fetal bovine serum extracted from unborn calves. But from a sustainability point of view, juicing a baby cow to grow a burger is less than ideal. It also doesn’t do much for cultured beef’s image as a cruelty-free product. And, while it may be an unlikely scenario, a disease-contaminated batch of fetal bovine serum could spell disaster. Better off, Post says, if we could work out an animal-free culture serum — one based on photosynthetic algae or cyanobacteria, perhaps. Another technical issue Post’s team is trying to sort out how to boost cultured beef’s iron content. In muscle tissue, iron is found primarily inside an iron and oxygen-binding protein known as myoglobin. But because lab-grown meat lacks a circulatory system, it’s kept in a very high-oxygen environment, which has the unintended consequence of reducing cellular myoglobin expression. Less myoglobin means less iron, poorer nutritional content and a weaker flavor. Once Post is satisfied with cultured beef version 2.0 — a fattier, more iron-rich and animal-free substance than its predecessor — he’ll start thinking about scaling up. Going from petri dishes to factories raises a host of new issues. For one, there’s that oxygen problem again: Without a circulatory system and blood vessels to shuttle O2 around, we can really only ever hope to grow thin sheets of meat. Post wouldn’t get into specifics about the technologies involved in scaling this process up, other than hinting that 3D printers and new types of scaffolding materials might be involved. In the cultured meat facilities of the future, impeccable cleanliness will be another top priority. Keeping everything sterile will no doubt up the maintenance costs, but Post sees it as a worthy challenge. That’s because, if we can ensure truly sterile production conditions, we might be able remove antibiotics from the equation. As for the public’s reaction to encountering lab-grown beef in the grocery stores? That’s something Post spends a lot of time thinking about. But Post reckons we’re still ten or twenty years away from producing cultured beef en masse. Right now, growing a burger that’s just as mouth-wateringly juicy and flavorful as a natural beef patty—and figuring out how to scale up—is keeping the our cultured beef-makers plenty busy. An affordable, scaleable cultured beef industry would go a long way toward reducing humanity’s environmental footprint. But Post isn’t the only scientist trying to cook up meat in the lab. In fact, way back in 2002, a NASA-funded team demonstrated it was possible to grow fish filets outside of a fish. Admittedly, this early effort was a bit grisly: The team cut chunks of muscle tissue from freshly slaughtered goldfish and dunked them in a culture fluid for a week. The tissue chunks grew by over 14 percent, which lead scientist Morris Benjaminson attributed to partially differentiated myoblast cells dividing to make more of themselves. Goldfish filets never caught on, but Post tells me that a few other research teams have recently begun investigating cultured seafood again, presumably using more modern techniques. Meanwhile, the Modern Agriculture Foundation has taken up the lab-grown chicken challenge. In some ways, that effort is even more ambitious than Post’s stem cell burger. Rather than growing a handful of individual cell types, Friedman’s foundation is hoping to clone entire chicken breasts—complex, 3-dimensional organs. So far, Future Meat—the MAF’s cultured chicken research program—has only conducted feasibility studies, looking at the costs, time and ingredients associated with growing whole chicken breasts in vats. 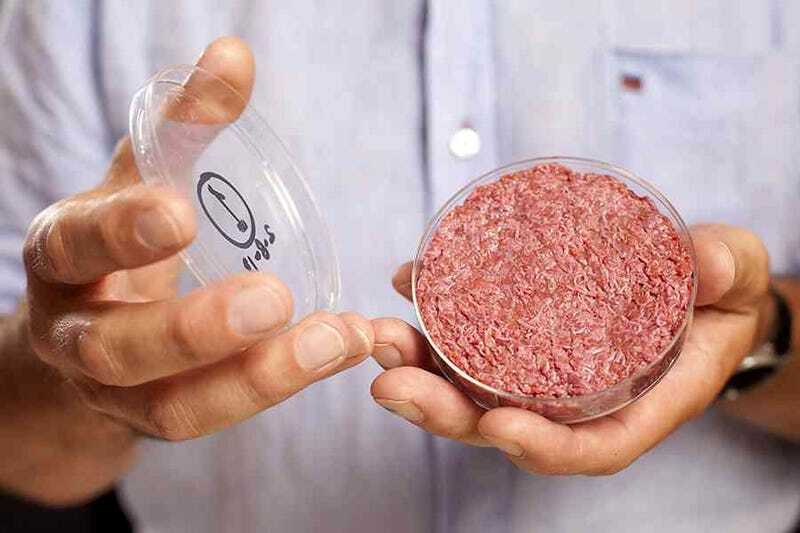 There are some parallels to the burger meat effort: For instance, Future Meat’s lead researcher Amit Gefen told in an email that his team is very interested in coming up with a veggie-based culture medium that would eliminate animal serum from the production process. But in many ways, Future Meat’s goal is very different from that of the Post lab. Engineering 3D-organs means thinking about how different cell types will interact, and how to coax tissues into taking on a certain size and shape. It also means worrying a lot about oxygen and nutrient availability. While some tissue engineers are trying to develop synthetic capillary networks for artificial organs, Gefen is hoping Future Meat can avoid that additional complexity with a cleverly designed bioreactor. Gefen envisions his bioreactors will have the ability to stimulate growing muscle tissue, either mechanically or electrically, to facilitate proper development. Again, this is all very conceptual right now, but with more PhD student labor and grant funding, Future Meat is hoping to make headway on bioreactor prototypes within the next several years. Cultured meat still has a long way to go, but it’s exciting to see groups of scientists around the world taking up the challenge. And in a very short amount of time, we’ve seen major progress. This past April, Post announced that his team has managed to cut the cost of cultured beef to just $80 per kilogram, or roughly $11 per burger. That’s a pretty stunning price drop, considering two years ago one of his burgers could’ve financed a med student’s education. As public awareness of cultured meat grows, proponents like Friedman and Post seem hopeful that their products will, one day, become just as acceptable as meat grown on animals — perhaps even more so. Personally, I’m looking forward to the day when I can order a cultured salmon roll without wondering if my fish was sustainably harvested, or a McDonald’s quarter pounder without imagining the sorry life of the animal it came from. Bring it on, science. This was originally posted in August 2015.